Tables with drawers are really enjoyable to build, but how everything fits together can be confusing for beginner woodworkers. So I’m going to show you how my quartersawn white oak nightstands fit together. I did some research and discovered a major lack of written specifics on the anatomy of tables, especially how the inside drawer-holding parts fit together. I flipped through new and old books, and checked a bunch of DVDs, and virtually all of them just skip over the details. 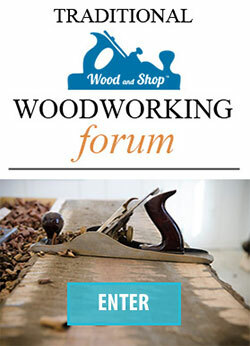 So a beginner woodworker would have to search extremely hard or figure out the process by examining well-built antique furniture (you certainly won’t find it by looking at most modern furniture). I just don’t think most beginners would go to all of the bother to figure it all out on their own. So I’m going to walk you through how a simple table and drawer fits together over the process of a build. This particular set of end tables is made out of the lovely quartersawn white oak lumber that I milled up with my friend Todd Horne, as featured in a video I did a couple years ago (watch it here). Before I talk about how all the joinery and parts fit together, lets first look at the names of all the parts of these nightstands. “Table Top”: The table top is the horizontal flat part that protects the interior contents of the table, and offers a surface for setting items on. These particular table tops were made by gluing up several smaller pieces of quartersawn white oak because I wanted less seasonal moisture movement, but mostly because I wanted wood figure on the entire top. It’s really hard to find figured wood that’s 18″ wide! “Apron”: The aprons (sometimes called “skirts”) are the sides and back that enclose three sides of the table. The aprons have tenons that fit into mortises cut into the legs. 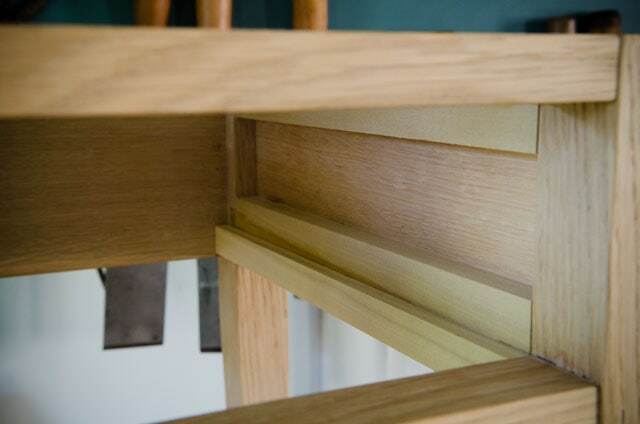 The rear tenons are beveled with a 45 degree angle to allow the side and rear tenons to meet in the rear legs without getting in the way of the other. 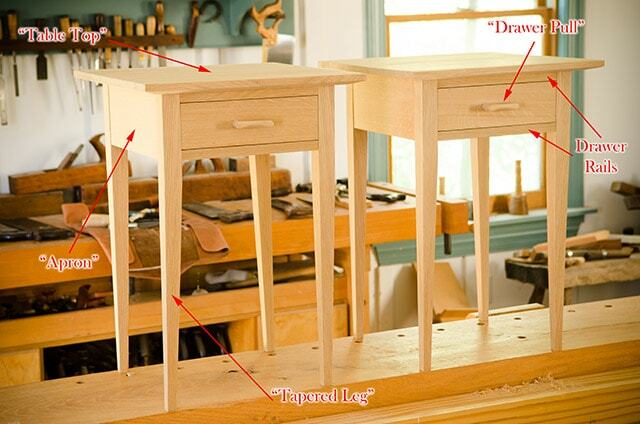 “Tapered Leg”: Legs are thin vertical pieces that hold the table up. Legs can be tapered (as pictured above), straight, turned on a lathe (with circular elements), carved, or a mixture of any of these. I prefer the delicate and simple appearance of the tapered leg, which is representative of the Shaker style of furniture. But you may like the straight legs from Arts & Crafts furniture or more fancy legs from classical furniture styles. “Drawer Pull”: A drawer pull is a handle or knob that is attached to a drawer front to enable the opening of the drawer. Drawer pulls can be attached with screws or, in the case above, a wedged tenon. “Drawer Rails”: Drawer rails connect the two front legs, and create a frame for insertion of the drawer. 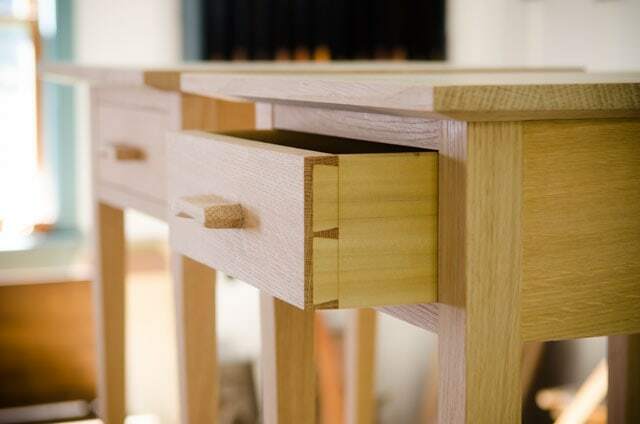 The lower drawer rail has a double tenon that fits into two small mortises in the front legs, and the upper drawer rail has dovetailed ends that are lapped into the tops of the front legs. “Spacers”: Spacers (or “doublers”) fill in the space between the legs and apron to offer a lateral limit to the drawer, to prevent the drawer from moving side to side. Historically these spacers were made from a secondary wood, like Tulip Poplar or some species of Pine. The spacers in the above photo are made from poplar. They are glued to the side rails. Glue is sufficiently strong to hold the spacers in place. “Drawer Runners”: Drawer runners give the drawers a surface to slide on, and prevent the drawer from dropping out of the bottom opening of the table. Drawer runners are simply glued onto the drawer spacers. The runners are level with the lower drawer rails. “Kickers”: Drawer kickers are like runners, as they restrain the movement of the drawer, but they sit level with the upper drawer rail and help keep the drawer pushed snugly against the drawer runner. “Drawer Rails”: As mentioned above, drawer rails connect the two front legs, and create a frame for insertion of the drawer. “Drawer Front”: The drawer front is the only visible part of a closed drawer (aside from the pull) and is made from primary wood (like quartersawn white oak, in this case). Drawer fronts usually feature the most visually pleasing wood on the table, as it is the most visible of all table parts. A groove is plowed into the inner side of the drawer front to accept the drawer bottom. “Drawer Sides”: The left and right drawer sides are connected to the drawer front with half-blind dovetails. Drawer sides are usually made from a secondary wood, like Tulip Poplar or some species of Pine. This saves the furniture maker money, and lightens the drawer. The drawer sides also have grooves plowed into the inner sides to accept the drawer bottom. 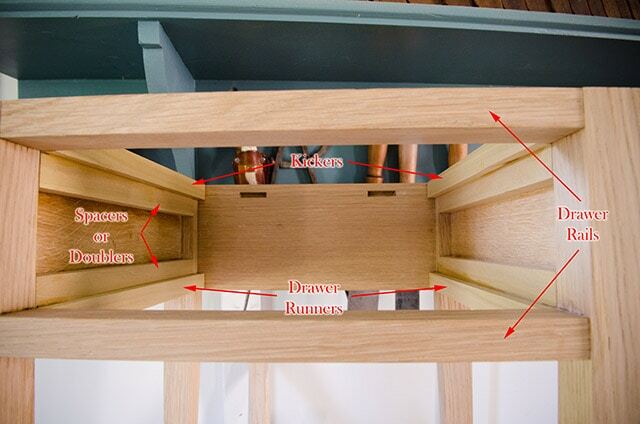 “Drawer Back”: Like the drawer sides, the drawer back is also made of a secondary wood, and is connected to the drawer sides via through-dovetail joints. The drawer bottom is shorter than the drawer sides and front, to allow the drawer bottom to escape underneath it when seasonal changes in humidity cause expansion and contraction of the drawer bottom. “Drawer Pull”: A drawer pull is a handle or knob that is attached to a drawer front to enable the opening of the drawer. Drawer pulls can be attached with screws or, in the case above, a wedged tenon. I made these pulls with chisels, rasps, and sandpaper. “Drawer Bottom”: The drawer bottom holds all the contents of the drawer, and prevents them from falling out. 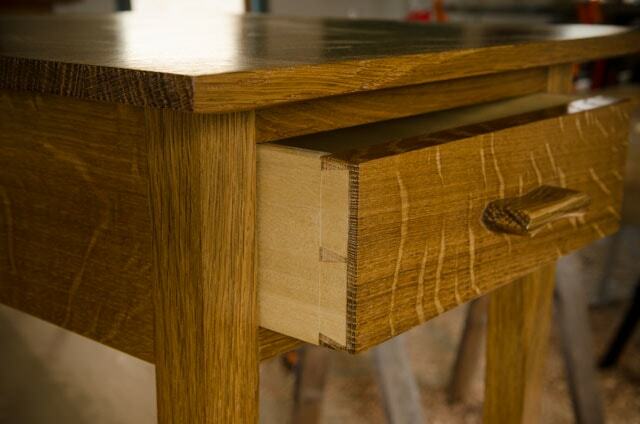 Drawer bottoms can be made of plywood (because it doesn’t expand and contract much), but a superior custom drawer is made out of solid wood, like poplar or pine (secondary woods). Solid drawer bottoms allow a thicker bottom, with edges that are beveled with a handplane to fit into the grooves in the sides and front. Antique drawers usually have the handplane marks on the bottom. I used a bandsaw to resaw a poplar board for my bottom, milled up the two halfs, and glued them together to form a solid bottom. As mentioned above, the drawer is built to manage the seasonal movement of the drawer bottom. 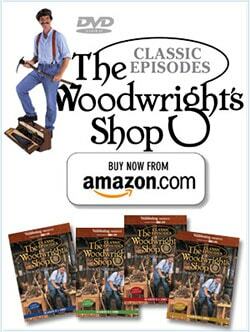 Wood doesn’t expand and contract lengthwise, but it does expand & contract widthwise. So furniture makers arrange the drawer bottom in a way to allow the expansion to occur out the back of the drawer. As the below photo shows, the drawer bottom sits into the grooves that were plowed into the drawer sides and drawer front, and then sits on the drawer back. The drawer bottom is screwed into the drawer back with one or two screws (only one screw for a small drawer like this). The pilot hole in the drawer bottom is drilled wider than the screw to prevent the drawer from splitting with seasonal movement. It’s like wearing elastic pants during the holiday season. 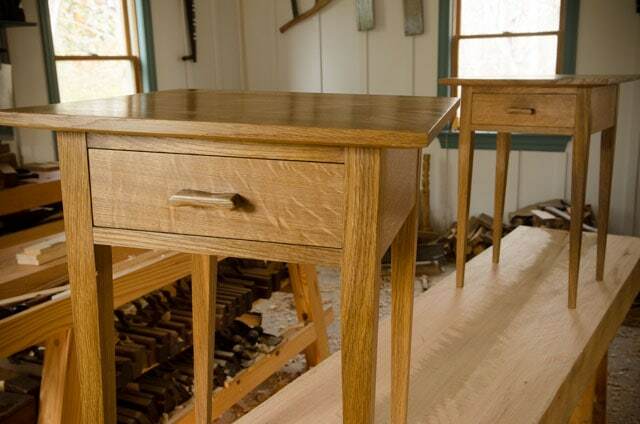 This table fits together with tenons on the aprons, inserted into mortises that are cut into the four legs. 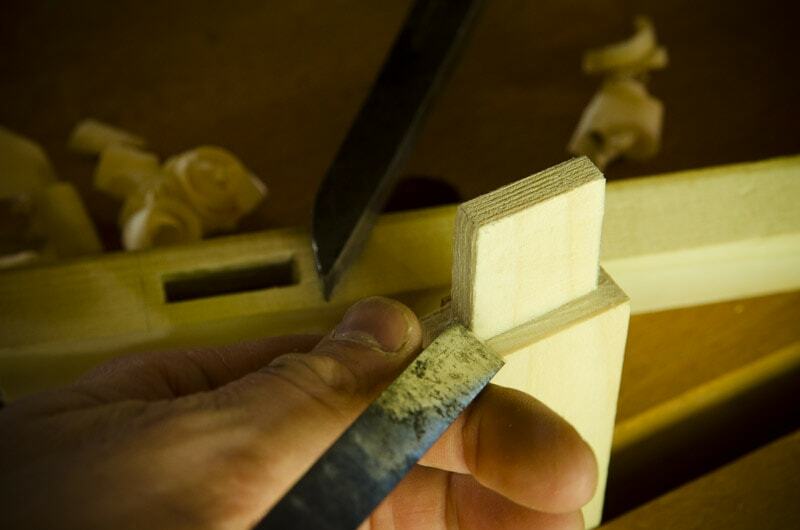 The rear tenons are beveled to allow them to clear each other inside the mortise. The rear legs, of course, have two mortises. The front two legs are different. Like the rear legs, they have mortises that accept the apron tenons, but on the interior faces are mortises that are cut to provide an opening for the drawer. These mortises hold the drawer rails. 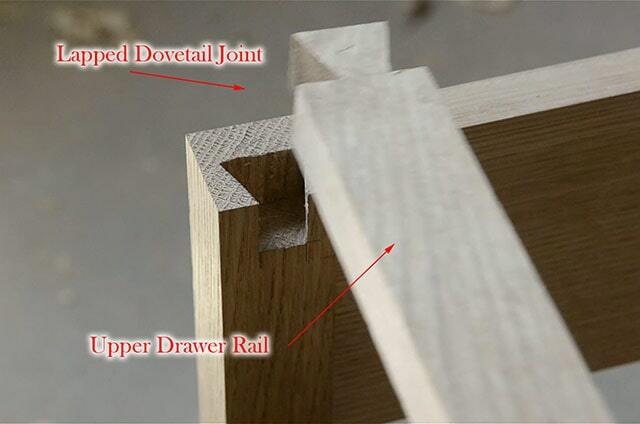 The lower drawer rail uses a double tenon and the upper drawer rail uses a dovetail lapped into the top of the leg. 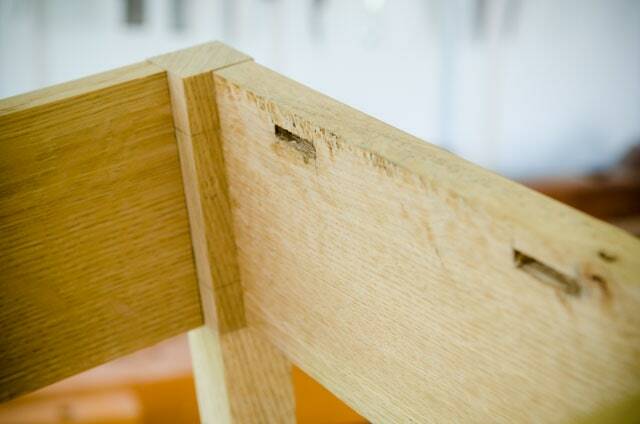 The dovetailed rail sits proud of the top of the leg so it can be planed down later when fitting the table top. Don’t worry if your rail dovetails look ugly like mine. They’ll be covered with the table top later. Let’s discuss table legs. I love the look of tapered legs. You can also have turned legs, straight legs, or carved legs. The taper usually stops a few inches down from the drawer rails. After the table frame is glued up, it’s time to make custom spacers, or doublers as some people call them. These are made of secondary wood (like this Poplar) and are made to be flush with the legs. These can be permanently attached with wood glue. The glue is certainly strong enough to keep them attached. Next, the kickers are added for the drawer to run along, and the kickers are added up top to keep the drawer tight against the runners. 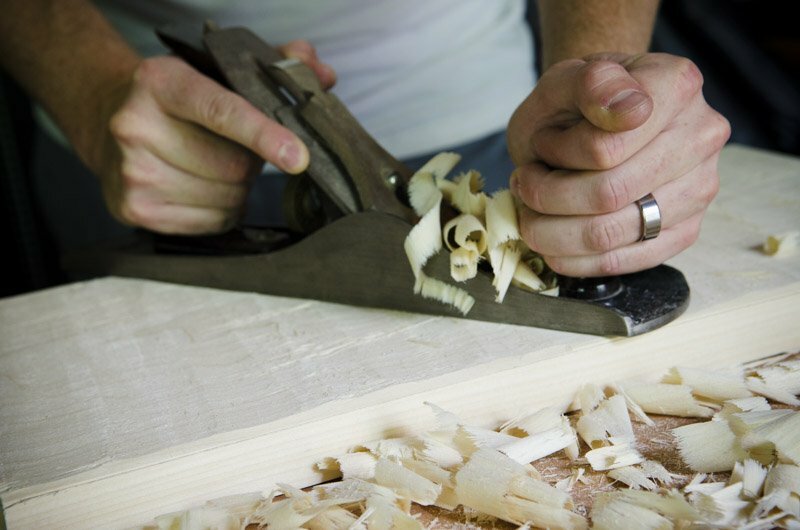 There are a variety of methods for attaching table tops, but one is to cut shallow mortises into the rear apron and, side kickers, and front rail, and make wooden “buttons” that hold the table top tight, while allowing seasonal wood movement. 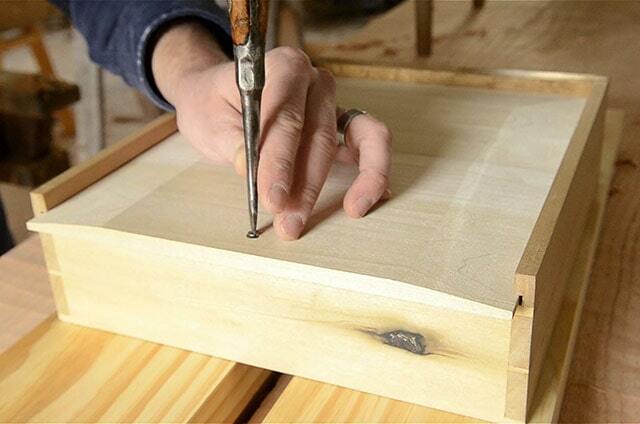 The button mortises should be cut before gluing up the table. 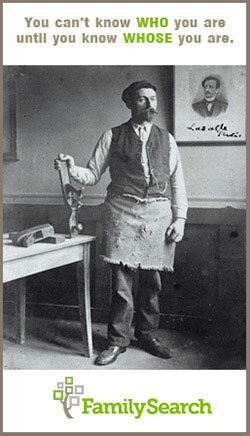 I chisel out the button mortises with a ¼” chisel. Buttons are made out of scrap wood, and historical slotted screws are driven into pre-drilled pilot holes. Table top buttons do, however, take a long time to install. Even more than table top buttons, I’m particularly fond of the figure eight table top fasteners. 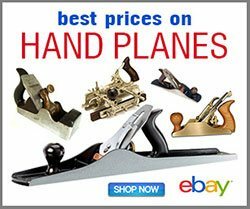 Lee Valley / Veritas is currently the most economical place to purchase table top fasteners: here and also here. Even with shipping charges from Canada, Lee Valley is still cheaper than anywhere else that I’ve found. 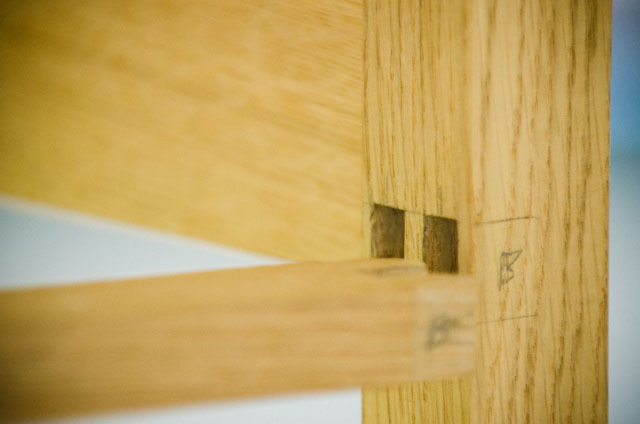 Both of these table top fasteners also allow for seasonal wood movement, if installed correctly. I prefer to use an undercut bevel for the tops of my end tables, to give it the aesthetics of a thinner top, but the strength of thicker top. And the slope gives it a nice look. I use a hand plane to make these undercut bevels. Beveling with a handplane is faster than making undercut bevel table saw jigs. But if you plan on making a lot of these tables, using the table saw is the way to go. An undercut beveled top is one sign of quality in an end table like this. After my drawers are glued up and fit to the table, I use a block plane to bevel the tops of the drawer sides to prevent dings from showing up. 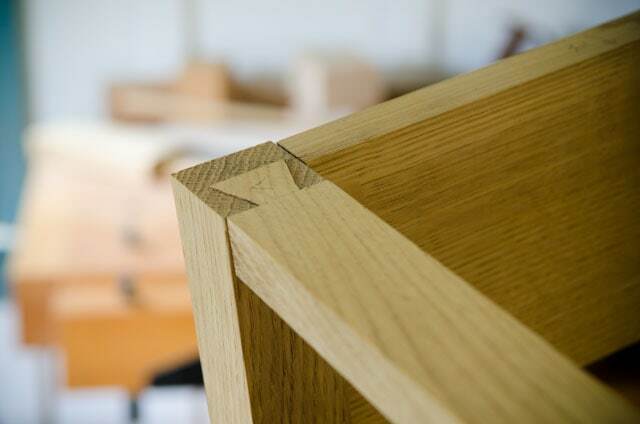 You can also see how nice the half-blind dovetails look after the drawer sides have been hand planed for fitting. The marking gauge line remains visible, which is historically accurate, so don’t try to sand it down! I also finish the secondary wood parts of the drawer with a few coats of thinned down dewaxed shellac (scuffing between coats with steel wool) and then I add wax after the shellac is dried. It gives a slight amount of moister protection to the drawer parts. Thinned shellac only takes a few minutes to dry, so this process is very quick. But you certainly don’t need to do any finishing on the interior drawer parts. The drawer fitting process includes creating a slight space above and below the drawer front, called a “reveal” to prevent the drawer from hanging up, and also for aesthetic purposes. Drawer stops are added to stop the drawer from going too far into the table. They stop the drawer front even with the drawer rails. I simply glue little blocks on the lower front drawer rail. On these particular night stands I used a historical finishing method called “fuming” with ammonium hydroxide, or Ammonia as it’s known to most people. In a confined space, the ammonia will react with the tannin in the white oak, darkening it. I’ll be sharing a video tutorial on fuming these tables in the near future, so keep a look out for it if you’re interested. After a couple days of fuming in my plastic tent, the end tables look dark and lovely. But not as lovely as when adding a finish. The grain just pops when adding a finish like this. A recipe and instructions for this great penetrating, yet protective, wipe on finish can also be found below. I then add a drawer bottom. As mentioned earlier, the drawer bottom’s grain runs side to side, which means the wood will move front to back. This is why the drawer back is kept out of the way. The drawer bottom is beveled with a hand plane, and then attached to the drawer bottom with a screw. The screw hole in the drawer bottom is slightly larger than the screw, so that seasonal wood movement won’t destroy the drawer. I like to use historical-style slotted screws for this purpose. You can check out my video blog post on making affordable historical slotted screws here. And here are the finished tables! Hopefully this has educated you on the anatomy and process of making tables with drawers. It gets a bit more complex when introducing more drawers, but that will be a lot easier for you to understand now. I get educated more and more each time I build something, so now go and build a table of your own! This is an easy, lovely, and protective wood finish recipe that is based on a recipe that my friend Will Myers shared with me. I like it because it brings out the figure and gives depth with some oil, but offers protection that a table needs, without getting a plastic look. 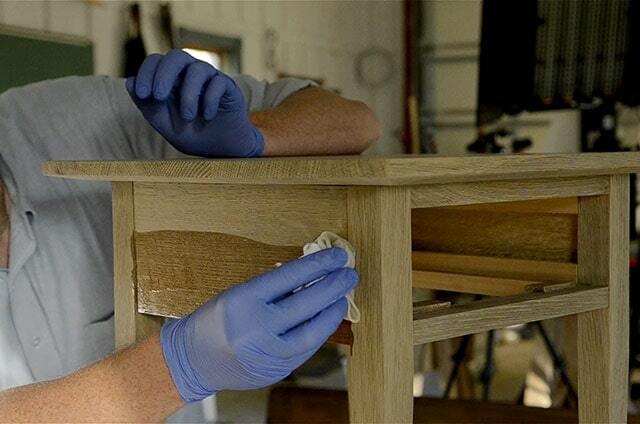 Mix Natural Danish Oil and Satin Polyurethane in a 50/50 mixture. I like to use a small jam-sized canning jar (8 oz – 12 oz. size). Use a lint-free cloth, or old t-shirt scraps to wipe on a first coat. Wait 10-15 minutes, and then wipe off the excess with a clean cloth. Let the first coat dry for three days. Lightly sand or scuff between coats with 0000 steel wool, an ultra fine Scotch-Brite pad, or very fine sandpaper. This finish really doesn’t build enough film to need wet sanding, so just lightly dry scuff between coats. After the last (third) coat has dried for three days, lightly scuff the surface again, and buff with a nice furniture wax. Waiting a week before applying a wax finish is even better so that the finish gets a nice long time to harden. Be sure to follow the can’s instructions because leaving wax on too long before buffing it out can cause you problems. I think 10 minutes is a typical max wait time for buffing. Bonus Tip: This finish will thicken up and be unusable after a few weeks, so if you have leftovers, I spray a bit of Bloxygen to preserve it and then close the lid. I also spray this into my danish oil can and polyurethane can (and all my varnishes). 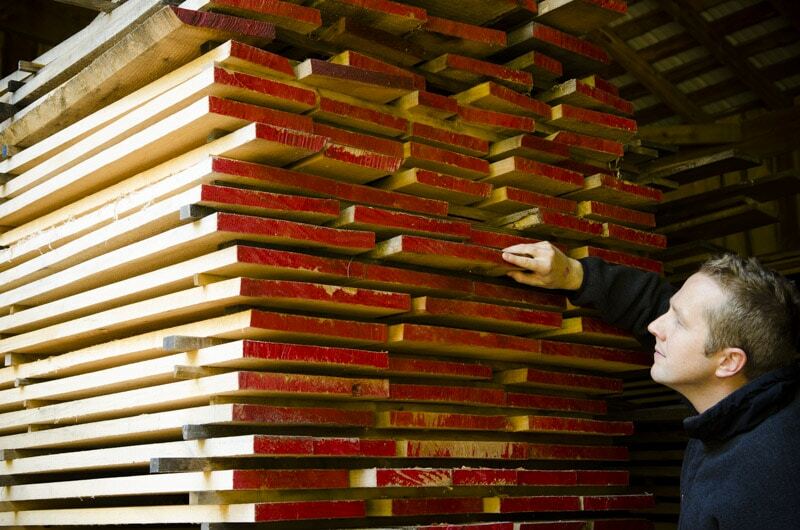 Bloxygen is argon gas that displaces the oxygen, which preserves your wood finishes. It has saved me a lot of money in wasted wood finish. It’s especially good to spray in Waterlox, which tends to coagulate more quickly than other finishes I’ve used. I’m no finishing chemist, but I have mixed poly and BLO plenty of times. I’ll have to do the two finishes side-by-side to see the difference. Thanks for the comment! Glad it was helpful Al! Thank you for sharing this video. I have an end table project coming up (first time) and I learned much from you. 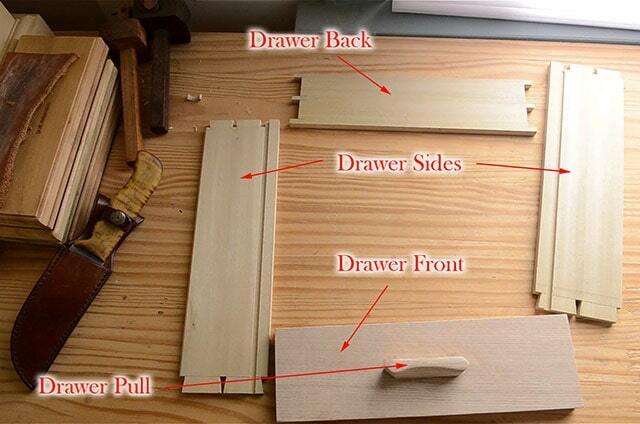 This is the most thorough description of the parts of a table with drawer I have ever come across. Excellent tutorial. Glad it was helpful Jeff! What else do you feel would be helpful for me to teach? Josh, This is the ONLY drawer explanation I have e ver found in ANY literary plan . You have definitely produced a clear and excellent tutorial with this one. Also appreciated the formula for the “Will Myers Finish” which I intend to use on the Morvaian Workbench he taught me to build at Sir Roys. Hey Warren, great to hear from you! I’m really happy that this helped. 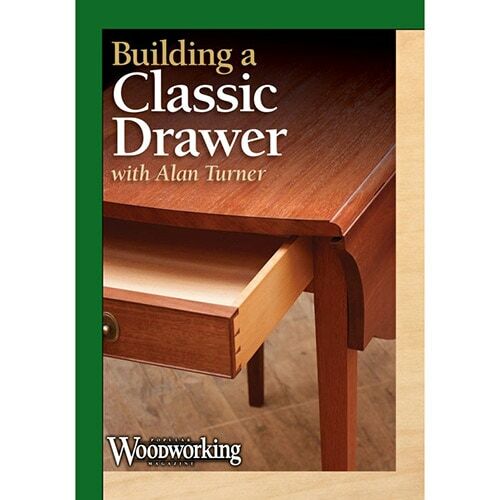 It’s true that there’s a major lack of instruction on this topic, other than some older Fine Woodworking Magazines. I’m going to work on a similar tutorial for wall cabinets with frame & panel doors, since there seems to be a similar lack of published information on those too. Do you think that would be helpful? Yes Josh, My knowledge of panel doors came from the class you and I attended at “Sir Roys”. Think fame and panel doors will make agreat tutorial. Sounds awesome Joshua. Thanks for all the hard work. 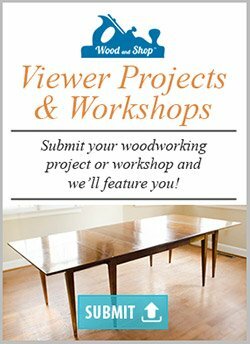 This is a great beginner wood working project. My high school students are going to love working along with this project. Fantastic! Where’s the school? 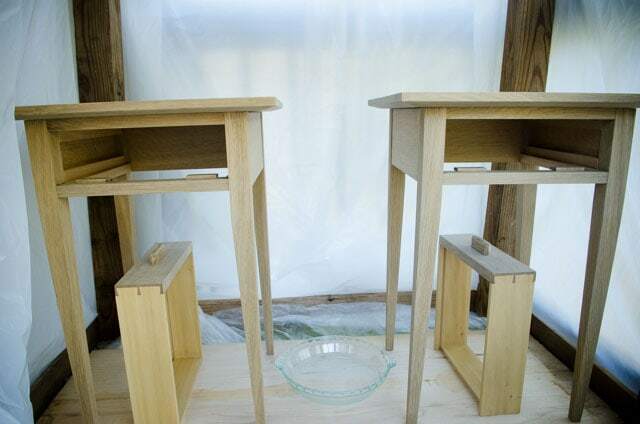 It would be great for you to share photos of the students building their nightstands! I’m up in Milwaukee at Messmer High School. I’m trying to get kids to use the math they learn in school to make amazing things. Intro to Craftsmanship is what I call it. The carpenters union is quite interested. They are garunteeing jobs to those students I find that show up on time, work hard, and have decent math skills. We’re building our traditional workbenches right now, so it will be a bit for the end tables, but I will definetely share! I thoroughly enjoyed this presentation of the functional aspects of table/drawer design! Your explanations have expanded and reinforced my understanding of the “why” of the design – I think this will help to make it easier to make my own. Thank you! A natural companion presentation, and something I would really love, would be follow-on video that covers the same aspects of dresser anatomy! 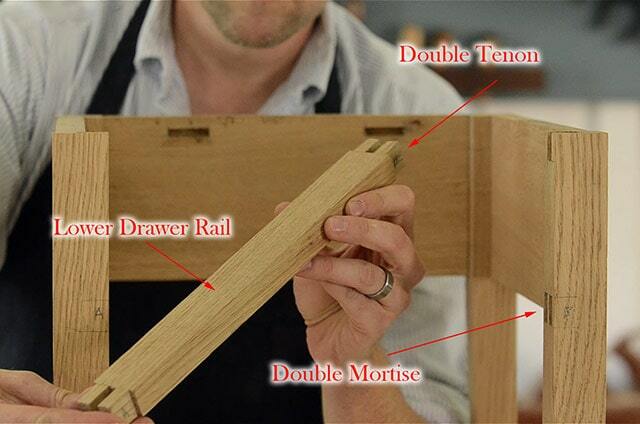 Oh, and I’ll keep the anatomy of a dresser build in mind…thanks for the feedback! 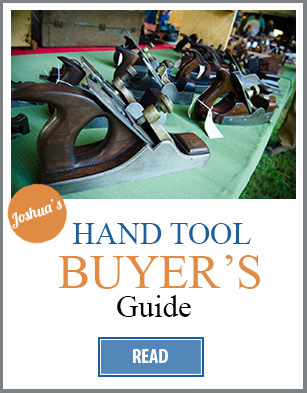 Dear Joshua I am so charged to read the details of carpentry in your article, that I really want to come down to your workshop sometime soon and see you live creating the masterpieces. Is it somehow possible to experience this in reality?? I guess, May would be the ideal time to visit and to plan ahead. Thanks. Joshua,would you mind giving out the dimensions of the end table? Thanks, Joshua. Your work and the resources you provide online are terrific. 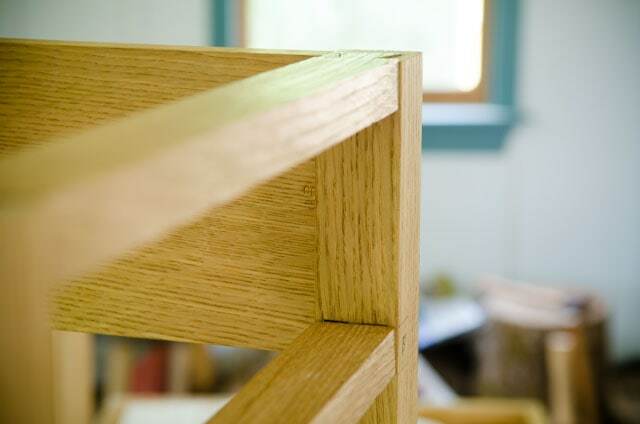 Regarding the finishing of the tables, is there any other way to get a traditional looking finish that reveals the beauty of the quarter-sawn oak without having to use ammonia? I am trying to keep as many toxins out of my shop – and away from my family – as possible. Thanks, again. I will be grateful for your reply. You can try a finish with pigment stains and dyes. 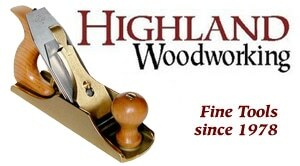 Fine Woodworking Magazine had an article in issue #157, pages 42-45 called “Safe and Simple Arts and Crafts Finish”. Hope this helps! Thanks, Joshua! You are clearly as generous as you are highly skilled. If I didn’t live way out here in the Pacific Northwest I would be taking your classes. 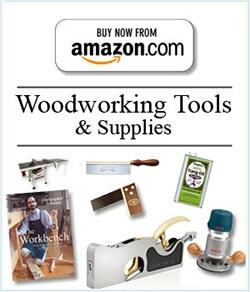 Let me know if you ever come out here to our Port Townsend School of Woodworking. You’re most welcome! And thanks for the kind words. What do you mean by generous? Classes? You teach classes too? Hmm, I’m in Shenandoah county, your just over the mountain. I run a small woodshop out here, also focused mostly on hand tools. That’s great to hear about your shop and classes! Do you have a website I can check out? You should drop by sometime.